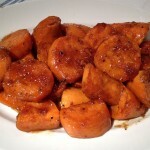 You simply couldn’t serve Thanksgiving turkey without candied sweet potatoes or sweet potatoes of some kind. But they are good all winter long and this is a simple great recipe. Double or triple this recipe and it’s great to serve with turkey or baked ham and goes terrifically with Swedish Christmas ham. Believe me I know! I can just see all the Swedes giggling! But for me it works well. At holiday meals it’s hard to beat mashed potatoes but you could serve this recipe and white mashed potatoes which I do at Thanksgiving. This recipe is sweet but not too sweet. The potatoes keep there texture and firmness and unlike a lot of sweet potato recipes there are no marshmallows and your teeth won’t hurt from all the sugar. Sweet with maple syrup and brown sugar these are excellent. Not too sweet the beauty of the potato comes through. A really simple recipe and really tasty. 1 kilo sweet potatoes Peeled and cut into 2 cm thick rounds. 20 gr fresh ginger finely grated or 10gr dried. Preheat oven to 190°C or 375°F. Lightly butter the bottom of a baking dish just large enough to hold all the potatoes in one layer. Peel and cut the sweet potatoes into 2 cm rounds. Very large potatoes can be cut lengthwise first. Add all the ingredients to the baking dish but the butter. The potatoes should fit tightly in one layer. Using your hands is the most efficient way of doing this. Dot the top with the butter and bake for 30 minutes, remove from the oven and turn all the potatoes over and be sure all of them are well covered with the sugar syrup in the bottom of the pan. Bake for another 15 minutes. Test as you would for potatoes using the tip of a small pointed knife for doneness. 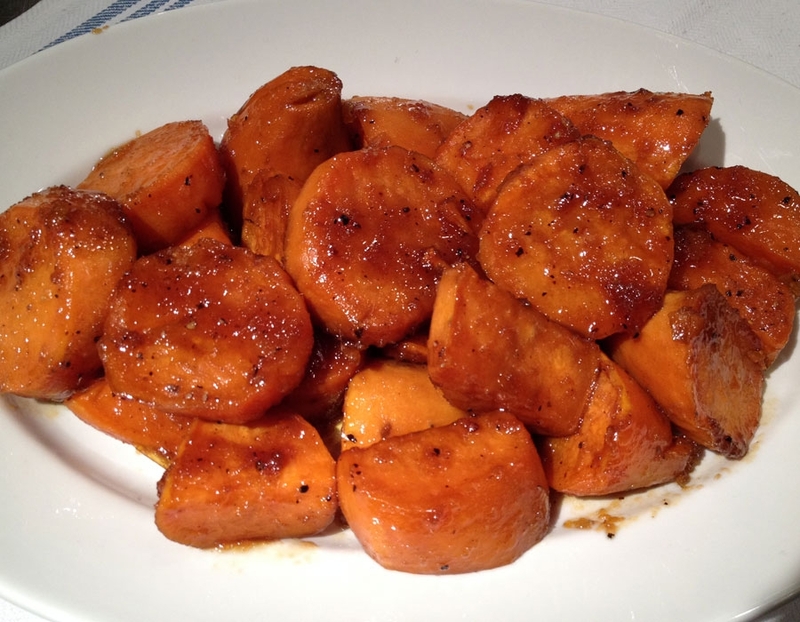 Sweet potatoes and yams take less time to cook than regular potatoes. They bake, boil or steam in about half the time. Test as you would for potatoes using the tip of a small pointed knife for doneness. The differences between a Yam and a sweet potato are; Yams come from the genus Discorea and sweet potatoes come from the genus Impomea which really makes them a different plant. Sweet potatoes have a darker brick color and are very high in vitamin A, and have a more moist texture, while yams are colored bright orange and have almost no vitamin A and are dryer in texture. Neither yams nor sweet potatoes store well and should be bought when needed; you can keep them in the bottom of the refrigerator if you need to keep them for a week or two. Both can be used in almost any white potato recipe. They also have the added advantage of lending themselves to being used with fruits. They are close in taste; it is the texture and vitamin content that really makes them different from one another. Sweet potatoes are more nutritious with their high vitamin A content.